For the town, the story began and ended the night that Toni killed Nicole. But for Toni, who claims she did not kill her sister, the story begins much earlier. Toni Murphy was counting down the days till she graduated. Her and her boyfriend, Ryan, were going to move in together- leave behind the lives they were living at home- Toni, tired of her mother bossing her around and trying to run her life and Ryan, tired of his dad taking out his frustrations on him. Toni is so close to freedom, to living the life she wants- she can taste it. Till one night, when everything changes. After Toni is accused of killing Nicole, the already terrible relationship with her mom deteriorates even more. With the town believing that Toni killed Nicole, and this band of girls, girls who on the outside look like perfect teenagers- but have vicious and mean sides (and have tried to ruin Toni’s life for standing up to them in high school) take the stand at the trial, telling everyone that they knew Toni killed Nicole. After Toni and Ryan are convicted of Nicole’s murder, the years they spent in jail are some of the worse. But, after Toni is on parole- she finds out that being out on parole may not be as easy as she hoped. Toni still wonders exactly what happened that night and she begins to realize that the girls who tormented her may know more than what they are saying. And these girls may not be happy that Toni is out on parole. Toni keeps trying to live her life, but part of her wonders exactly what happened that night. Too bad for Toni, some secrets are so dark- they desire to be kept buried forever. Wow. This is my first Chevy Stevens and I wasn’t sure what to expect. But, I enjoyed this book. I found the plot to be so interesting. However, the characters are another story. Toni, sometimes, had such a backbone- but then at other times, she was almost cowardly. Toni’s mom, oh good grief, her mom! Like on some level, I could understand her- she’s lost a daughter. But, some of her behavior- at times I wish she would have just talked to Toni. Tried to understand her, instead of how she treated Toni. She treated her daughters like one was perfect and the other was the screw-up and whether she could see it or not- some of her behavior played a role in how that night, that infamous night played out. For a good bit of the book, the reader probably thinks they have some of what happened that night figured out; but Chevy Stevens takes care to not make the ending predictable. There are not many twists and turns, exactly, in THAT NIGHT- but the ones Chevy places in the story are powerful and pack a punch. After finishing THAT NIGHT, my brain was twirling and twisting- trying to think everything about the book through. Some of the characters are unlikeable, and at times I ached for the unfairness of the situation that Toni was in- but ultimately, THAT NIGHT deserves a read. *This book was sent to Traveling With T in exchange for a fair and honest review from St. Martin’s Press. The above thoughts and opinions are mine alone. 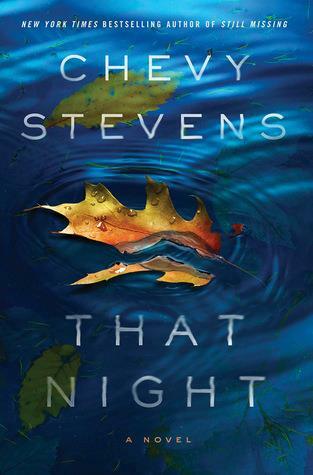 June 16, 2014 travelingwitht	#TravelingWithT, Books Reviewed by T @ Traveling With T, Canadian Detectives, Mystery Thriller Suspense, St.Martin's Press, That Night, That Night by Chevy Stevens, Thriller, What happened THAT NIGHT? The characters- well, they are not the most likeable! Let me know what you think of it! Keep an eye on my website- in a few weeks, there will be some giveaways! The fighting between Toni and her mom sort of grated on my nerves. Toni just seem so disrespectful and bratty–really, all her mom asked of her was to clean up her room. At least, that’s all the farther I got as to their fighting. I’m not very far along but am enjoying the book. I don’t really like Toni much, but do feel sorry for her being in prison wrongfully convicted and that Shauna, her arch enemy, is a piece of work! I really don’t like her!!!! YES! I totally get that- but her mom, at some point in the book, becomes less understandable and more of a pain (imo!) Toni def has some unlikeable things about her- but that is what made her such an interesting character! Shauna- oh good grief- that girl is bad news! I liked this one a lot. Even though Toni is far from a perfect character, I found her faults compelling. And I really rooted for her to find the real killer so she could move on with her life. YES!!!! You totally summed up my thoughts about this book. Toni was not perfect. At times, she needed a good pinching. But all her faults, her attitude, etc- all that did make her a compelling character!